I am continually fascinated by the slow unfolding of the Self that a regular Yoga Practice helps to facilitate. I am deeply interested in helping to guide students into a regular yoga practice to create an awakening through consistency, balance, inner-listening, and touching in on our own discernment. Begin your day with Shree Yoga. The Morning Teachers & I challenge you to meet us on your mat, first thing in the morning, when the mind and body are clear & receptive. We will begin our Early Morning Challenge through the darker mornings of Winter and into the new year as the days grow with more light. Jennifer Ammann will be teaching Monday & Wednesday 7:30am. Read her article HERE about the Winter Solstice Sadhana on LiveTaos. 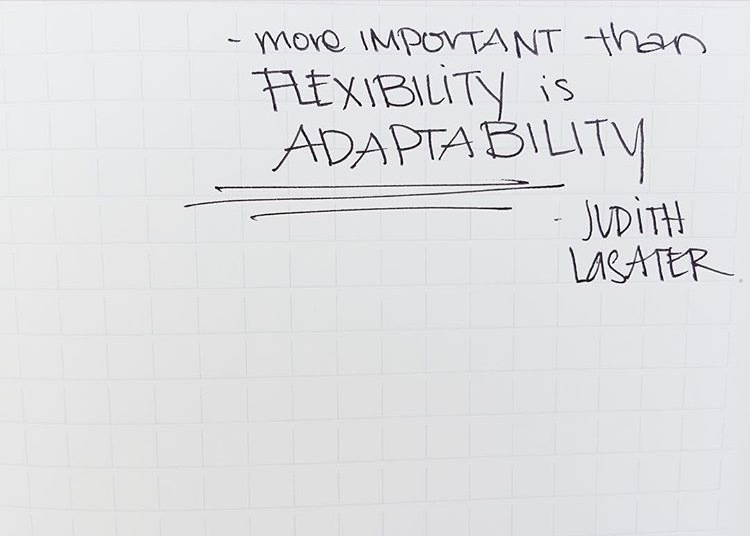 Assisting Tias Little at the Yoga Journal Conference this fall in Colorado was a valuable experience in understanding how adjusting and assisting is just as communicative as teaching the class itself. The art of touch while understanding the energetics of the pose can be truly healing. While working as an assistant, I was able to observe Tias work while also being of service to students- discovering that as teachers, we are laying down the ground work for each practitioner to experience themselves. The following workshops and day-longs allowed for the students to first settle in energetically with meditation, take flight with arm balancing classes to experience their fire energy, and finally into deeper workshops to connect to our subtle body. The Yoga Journal Conference was a union of inspiring teachers in the mountains. Each teacher I took a class from brought a different perspective to this fruitful subject. I was finally able to take classes from teachers in distant locations: Dharma Mittra, Judith Hanson Lasater, or Kathryn Budig. Deeply appreciative of this experience. As the leaves turn to a brilliant gold here in New Mexico, I am reflecting on the teachings offered by my teachers, Tias & Surya Little, this past summer at Prajna Yoga. The yoga training was inadvertently timed with the release of Tias Little's book "Yoga of the Subtle Body" which was a perfect companion to my summer learning with them. If you haven't picked it up yet, I highly recommend it! Tias Little weaves somatic concepts and wisdom teachings into the yogic perspective of anatomy, the mental, emotional, and energetic body. I spent my summer with an intimate group meeting with Tias & Surya at their temple where we studied the details of human anatomy and the subtle body with the perspectives of both Eastern and Western medicine. Using both group and dyad work we explored trauma and its effects on the human body and psyche. Tias held daily dharma talks and group discussion over poetry & myths. Lectures were given about the nature of the mind and how applying philosophy along with meditation helps us to uncover our true nature. A few of the new subjects that I found fascinating were Tias' Satya work inspired by Feldenkrais' Somatic methodology and the teachings of the Buddhadharma. The Satya work allows one to move more gently before more rigorous asana while the wisdom of the Buddhadharma helped to illuminate the 'seer'. Both of these practices have helped to increase sensitivity and ultimately creating a broader lens from which to experience. When I first began to explore yoga in San Francisco, I had no idea how incredible this journey would be. While receiving the poetic teachings from Tias and learning the deep body wisdom from Surya- I couldn't help but appreciate all of the teacher's who inspired me to continue and the students who kept showing up in class reassuring me that this path held some true "juice". Thank you for the article posted byLynne Robinson of TaoStyle about my recent joining at Shree Yoga Taos! As a few of you may have heard, I'll be moving away from San Francisco... and consequently, I will no longer be holding classes at Moxie as of February 13th. I have enjoyed the last 8 years in SF watching the city change... watching myself change. San Francisco introduced me to the practice of yoga and food culture. Here, my curiosity about our relationship to nature and learning of our own true nature began. My move to New Mexico is inspired by the ability to dive in deep with these subjects. My partner and I will be continuing /SHED, the dinner project we began in Marin, back to his hometown of Taos where he can return to his native roots and we can create a more permanent establishment. Along with this, I will be continuing my studies of yoga with Master Teachers Tias & Surya Little of Prajna Yoga in Santa Fe, New Mexico allowing me to give deeper offerings in my teaching. It has been such a pleasure to teach in San Francisco and to have been a part of the Moxie community. It is an honor to be a teacher on your path of yoga. Thank you to my teachers and the students who continued to come to class reassuring me of my path. As a Farewell Class, I'll be hosting a special 2 hour Advanced Practice tying together the physical practice, breath work, and meditation on SAT February 13th 5:30-7:30pm at Moxie. RESERVE your SPOT. Stay Connected: for recommendations or to continue receiving updates on workshops. retreats, and yoga tips stay connected with me.